Thank you for pushing out a second rather large human, which quite frankly I was convinced would never come out. Wow, that was eye-watering wasn’t it? And all done drug-free. Not our choice, you understand, but apparently Little Monkey just couldn’t wait. I can still hear myself yelling “Don’t let the epidural man go…” as the midwife chirped excitedly, “It’s too late, he’s on his way!” I wanted to hit her. But you did it body, you did it. 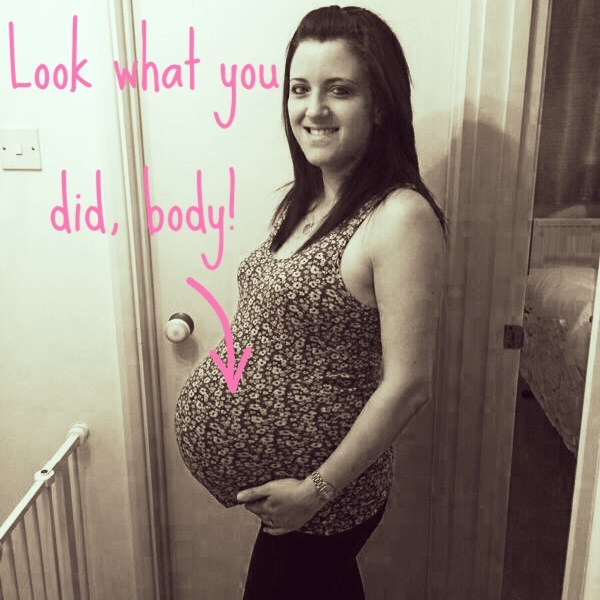 I’m sorry for not being kinder about the way you looked in those early postnatal months. I’m sorry I forced you to wear ‘comfy’ underwear and leggings for far longer than necessary. You deserved to look better. I’m sorry I then tried to squeeze you back into pre-pregnancy jeans far too early. It was painful. And unnecessary. I now realise that stretchy waist bands are the way ahead. Thanks for not giving up on me when I was at my most exhausted. How we got through those first few weeks still remains a mystery to me. Although I believe the vast intake of chocolate biscuits was a huge help. I’m sorry you get affectionally violated everyday by two little boys who think you’re a human climbing frame. Although I know we’ll miss the day they no longer jump all over us. I’m sorry for recently denying you all of the delicious treats that we love. Stupid diet. At least we fit back into our clothes now, but boy do I miss those late night snacks. Next time I look in the mirror and complain about the wobbly pouch that refuses to leave my tummy, I’ll try to remember what an amazing job we did and wear my pouch with pride. Or tucked into my underwear, at least.